This is a quick step-by-step guide to viewing the headers of an email via the webmail interface. Please note: This article is only applicable for email mailboxes on 34SP.com's Mercury Mail system. Firstly, you'll need to login to your webmail account at http://webmail.yourdomainname.com. When you have logged in, view the specific email you wish to view the headers of, firstly by locating it, then by double clicking on it. Please note: Where domain is "yourdomainname.com", please replace with your own domain name. 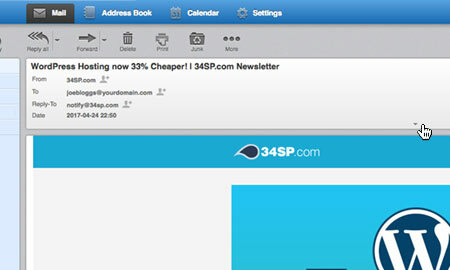 After you have selected the email to wish to view the headers of, navigate to the top of the email. Find the 'Down Arrow' just below the from/to/reply-to information. This will cause the content of your email to drop down, showing you the raw source of your email header.